Five things to look for as Penn State tries to bounce back from last week’s crushing loss at Ohio State in another tough road game at Michigan State. How will the Nittany Lions respond to blowing a 15-point fourth-quarter lead in last week’s 39-38 loss to Ohio State? The players on the team are high-character kids who have proven that they can overcome adversity, so most people believe they’ll do so again today with a strong showing. It’s not a guarantee, though. 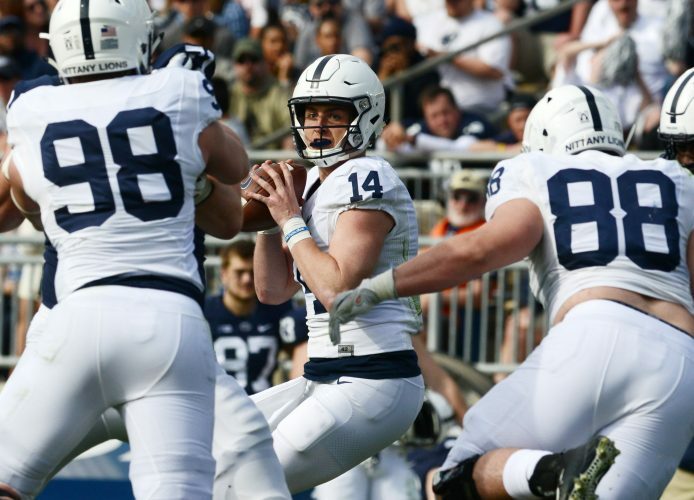 Penn State probably just had its College Football Playoff and Big Ten title hopes dashed in a devastating way, and now it has to hit the road again for an early kickoff. And if you’re only caught up in how PSU will respond, you also should know that this is a solid Michigan State team that also has a bunch of salty players and coaches following a triple-overtime loss at Northwestern. Look, these are kids primarily aged 19-22, and you never really know how they’ll react. Leadership is important coming off a disappointing loss, and it’s hard to imagine a more disappointing loss than what PSU suffered a week ago. So the team’s leadership will have to be a valuable asset today. The Lions must play well in the first quarter to gain early confidence, which is exactly what they’ve done all season, outscoring opponents, 104-3. It could prove to be more difficult today, though, against a physical Spartan team that will be trying to establish control of both lines of scrimmage. Offensive coordinator Joe Moorhead undoubtedly is aware of the high volume of criticism aimed at him and the playcalling last week. Expect Moorhead to come out today with a more aggressive game plan, with fewer Saquon Barkley runs into the middle of the line of scrimmage, where the Spartans will be waiting for him. Left tackle Ryan Bates was injured last week, and while nothing is certain, he’s not likely to play today. That means starting right tackle Will Fries would move over to the left side, and Chasz Wright would start at right tackle. Bates is the team’s best offensive lineman, so clearly he’s a big loss. The line hadn’t been playing too well this season anyway, and with him out of the mix, it becomes a huge concern. Penn State can win if the line plays well in pass blocking or run blocking. If it plays poorly in both areas, Michigan State certainly is good enough to take advantage and pull this one out. End Ryan Buchholz went down with what looked like a knee injury last week, and he likely will be out a while. That’s a big problem for the line because it doesn’t really have a replacement end who’s good at both stopping the run and rushing the passer. Shaka Toney is a solid pass rusher, but at 233 points, he’s just not big enough to be a force stopping the run all day long. One thing to watch for is if backup tackle Kevin Givens moves over to play some end, which he did earlier this season. The Altoona product is 287 pounds and incredibly strong, so he should be able to handle that spot, at least on a part-time basis. PSU: This could be a huge game for Barkley, as Moorhead will look to get the ball in his star’s hands in various ways to help pull out a victory and help his Heisman hopes, which took a bit of a hit after the loss to Ohio State. Michigan State: QB Brian Lewerke can hurt the Lions’ defense if he gets the kind of time to throw that Ohio State’s J.T. Barrett had last week. Lewerke also is a capable runner, so PSU will have to be ready for him to take off.